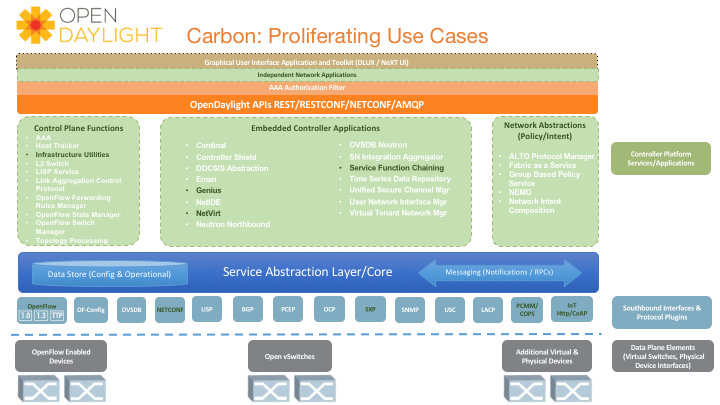 Carbon is the sixth release of OpenDaylight (ODL), the leading open source platform for programmable, software-defined networks. OpenDaylight has become the de facto open SDN platform, supporting over 1 billion subscribers as well as leading enterprises. With the Carbon release, the OpenDaylight technical community put a deep emphasis on three key areas. With Carbon, the vision of automating programmable networks comes into focus, and expands to new use cases. Foundational toolchains for cloud, NFV and management plane programmability have been incorporated as core components of higher-level open source frameworks, such as ONAP, OPNFV and OpenStack, as well as real-world implementations of designs from standards bodies such as MEF. These new combined stacks are increasingly enabling innovators to productively explore new use cases such as IoT. OpenDaylight was designed as a modular, general-purpose development platform which could be extended in myriad ways to support new SDN use cases as they emerge. This has been borne out in the case of Virtualized Central Offices (vCOs). As the telecommunications industry embraced the architectural approach, the NetVirt and Service Function Chaining projects have focused on providing integrated solutions for the NFV systems that support vCO deployments. At the same time, users including CenturyLink have built their own vCO solutions using OpenDaylight. Building on projects proposed by leading cable operators in 2016, Carbon now provides robust support for PCMM specs. This allows operators to better manage their deployments by optimizing network usage from the edge via rich quality of service (QoS) APIs as well as control power utilization across their networks via standardized energy management (EMAN) APIs. OpenDaylight also continues to lead the convergence of standards and open source. The Metro Ethernet Forum continues to be a leader among standards organizations with deep commitment to designs based on open source software, supporting recurring hackathons. OpenDaylight has been deeply involved with these efforts. Notably, the Carbon release UNI Manager project provides APIs and implementations of service orchestration for MEF services like ELAN and ELINE. The “Internet of Things” (IoT) is an emerging area of innovation, particularly in sectors such as smart cities, smart utilities, and connected healthcare. These use cases represent an explosion of traffic and data that can only realistically be managed with SDN, yet exploration has been hampered by the lack of a common method for bringing the various devices within a common management paradigm. Carbon adds the standards-based IoTDM plugin infrastructure to allow easy implementation of new device plugins. This production-ready infrastructure equally supports localized, small footprint use cases as well as massive scale up/out distributed deployments. Learn more about OpenDaylight use cases here. The creation and management of VNFs is a primary driver of both SDN and orchestration adoption. A framework for a modular stack using OpenStack, OpenDaylight and FD.io, called the “Nirvana Stack”, was presented at OpenStack Summit 2017, showcasing integration work done in Carbon. The “Nirvana Stack” framework takes advantage of all of this work, within the OPNFV test framework, to provide a common means of deploying VNFs within an OpenStack environment. Significant advances have been made in Carbon to orchestrate SFC functionality for OpenStack environments through new functionality and greater integration between the Genius, NetVirt and SFC projects within OpenDaylight. The ODL Genius project serves to eliminate interference between ODL applications using the same resources by providing APIs to move design-time coordination to dynamic run-time coordination. This makes the overall ODL architecture more flexible and easier to modify. In addition, Genius helps factor out commonly used functions into shared services to avoid duplication and waste of resources. The NetVirt project implements OpenStack networking for VMs. With the Carbon release, NetVirt integrates with Genius to dynamically create and manage tunnels and virtual network functions (VNFs) on demand and map traffic to individual service chains. The logical Service Function Forwarder (SFF) in the SFC project now abstracts network hosts as a single configurable entity in order to automate configuration, and simplify scaling, load-balancing and failover in large OpenStack data center networks. Carbon has enhanced the ODL Neutron plug-in to support L3VPNs within OpenStack. The plug-in now provides integration with OpenStack Keystone v3 as well as southbound support for FD.io’s VPP as well as OVS-DPDK. Security, scale, stability and performance (S3P) are improved along two significant dimensions. The core controller now supports very granular load-balancing within a cluster via prefix-based shards, permitting greater scale-out within single site deployments. And OpenDaylight deployments can be federated across multiple sites by allowing loosely coupled, distributed applications to share key datasets as peers using the new Federation project. This approach to multi-site federation improves geographic scale and application performance as well as fault tolerance. Carbon also includes ongoing improvements to a range of core project functionality, including new capabilities and greater standardization for OpenFlow and NetConf, and more robustness in utilities such as YANG tools and energy management.